I'm still hard at work, proofreading the backpack pattern instructions while my dear friend Brooke is busy making it all look pretty. Brooke has designed many of Martha Stewart's books as well as both of Joelle's (Joelle's new book is publishing next fall--I can't wait! ), and she has fantastic taste. I feel very fortunate to know her and work with her on this. I'll try to post all the information about the pattern, the materials list, the price, and hopefully even start taking orders sometime tomorrow. Sorry it's taking so long. But if you ever need a crash course in Adobe Illustrator, I highly recommend the Liesl method: a completely unaccredited, trial-by-error, by-the-seat-of-your-pants-style course requiring the completion of 45 technical sketches and one complete sewing pattern. The Liesl method is entirely self-taught during naptimes and in the evenings. A most educational process; I'm far more proficient with it now than I was two weeks ago. It's not exactly relaxing, however. When you throw in several workmen doing apartment repairs, a tantrum-prone toddler, and a couple of sewing classes already in progress, it all adds up to what I like to think of as a character-building experience. I came across this tote the other day and started using it again. I made it at least three years ago, got tired of it, and now I like it again although it's starting to look a bit worn. (Aren't we all?) My own design, a bit tricky to sew, but the first draft of any new design is often a puzzle to assemble: if I sew this part first, how will I attach that element? ... whoops, I should have sewn that seam earlier, etc. Ok, must attend to some of the other neglected areas of life, but I really will try to be back tomorrow. And maybe a bit more frequently again now that the crash course has been completed. I really should make myself a certificate of completion. Or at least reward myself with some ice cream or something. You know, you really shouldn't feel the need to thrash yourself in order to satisfy all of our greedy little souls. Take you time, make it enjoyable, enjoy the process. Oh, and it might be a bit dangerous to go showing us another of your yummy little bags - like I said, we're greedy - we might demand a pattern for that too! 1. that old-to-you-new-to-us bag is great. i love all the stitching details. 2. i thought that was how all software programs were learned... of course it isn't the most efficient way to go, but it is my preferred method as well. 3. ice cream, yes, go for the ice cream. I love your illustrator learning method. I learned it the same way, when I was teaching a six week bookbinding course and thought I'd develop illustrated instructions for all 5 binding styles. Wow, was that a lot of work. But worth it, illustrator is now my best friend. Is there any other way to learn? I am loving my backpack (I did splurge) and am looking forward to the pattern because I am thinking that it would be a fun gift to share with my sisters, my nieces, and my mother. Christmas, ho. What a great bag! Love the fabrics! yes! go have some ice cream! so looking forward to the pattern! yes, yes, yes for the ice cream reward! rewarding ourselves is something we need to do more often i think. :) a treat for a job well done! and finally, i can't wait for the pattern! Get the ice cream for sure. And maybe a cupcake too. That bag is so cute! 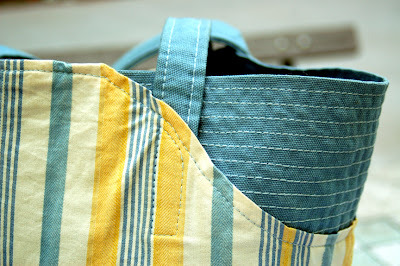 I love the top-stitching "stripes" across the blue trim. What a great idea! I'm sure there are some kind bloggers who'd help out with your illustrator woes. Though, that IS the best way to learn. I'd be happy to share my illustrator tricks. Shout out in a post or email me. I think carrying that bag is a huge certificate of completion! So cute. Can't wait for the backpack tutorial/pattern. I would love to buy this pattern. 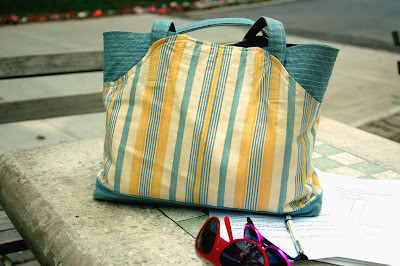 I think this bag is really cool and versitale. Thank your for doing this!